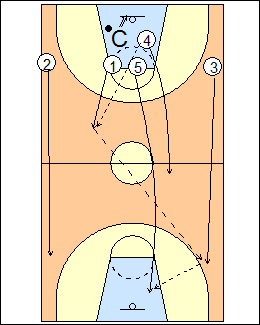 5-on-0 fast break drill, each player must make a layup, cross on the baseline, inbound the ball each time. Don't get stuck on the shooting order, make it realistic, whoever has an advantage. The less you put it on the floor the better, don't pass backwards, go as fast as you can. 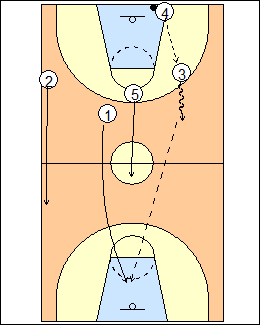 To start, coach shoots off the backboard, 4 rebounds, outlets to 1, here 5 takes the layup (add another trip for each miss, make your layup). See Layups - And twos. The first big inbounds, so 4 and 5 switch roles each trip (the trail post becomes first post). See Press break - Spurs 5-out. 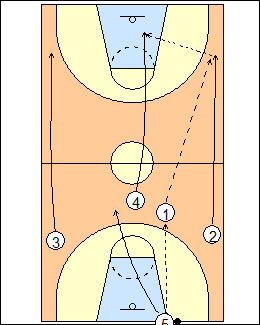 Bob Hurley - score on every trip, the first big inbounds to 1. 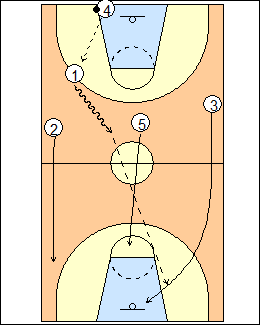 Billy Donovan - 4 is the designated inbounder, see Fast break - Florida five cycles. 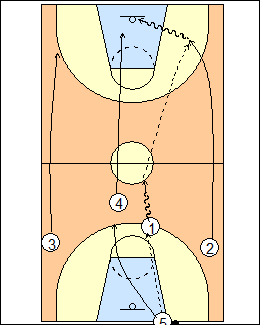 3 calls for the inbounds pass on the last trip, 1 takes off for a pass.